BIG SALE!! CRYSTAL WHITE LED LIGHT STANDS BIG SALE!! This 2 1/2" round, portable 3 WHITE LED light stand has a satin Silver Base, a flat mirror top with 3 extra bright White LED lights that produce twinkling yet continuous white light. There is an on-off switch on the side. Packaged with 3 AG13 button batteries included for days of continuous use. Click for AG13 10-pack refills. 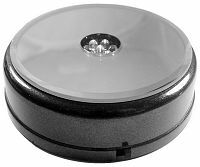 This 3 1/4" round, portable light stand has a shiny Black Base and a flat top with a 3/4" wide open center and 3 extra bright White LED lights that can be seen through a clear side light window in the middle of the base. The three white lights slowly turn on and off to produce a twinkling yet continuous extra bright white light. There is an on-off switch on the side. Use 3 AA batteries for days of continuous use. Batteries are not included, click for AA batteries. 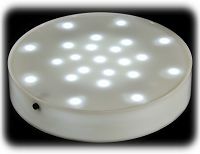 Here is our new style 3" wide portable White Light base now at a very affordable price! The base has 3 WHITE LED lights that stay on and do not twinkle, a satin Silver finish and a 3" W flat mirror top. There is an On/Off switch on the side and use 3 AAA batteries for days of use. Batteries are not included, click for AAA batteries. 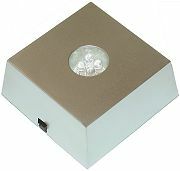 This 2 1/2" square, portable 4 white LED light stand has a satin Silver Base and flat silver top with a 3/4" wide opening and 4 extra bright WHITE LED lights that will light up your crystals, memorial glass and paperweights with continuous white light that does not twinkle. There is an on-off switch on the side. Use 3 AAA batteries for days of continuous use. Batteries are not included, click for AAA batteries. 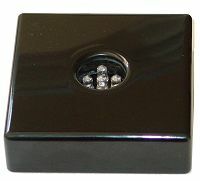 You asked for a Square Light base in an elegant Black finish and here it is! 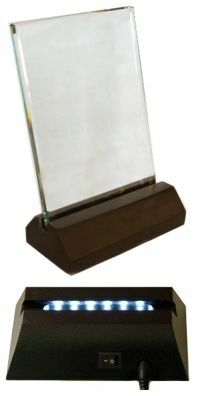 Classic 2 1/2" square, 4 white LED light base for your awards, 3D laser crystal or memorial glass. It has a shiny Black Base and a flat mirror top with 4 extra bright WHITE LED lights that stay on and do not twinkle. There is an on-off switch on the side. Use 3 AAA batteries for days of continuous use. Batteries are not included, click for AAA batteries. This 3 3/8" round, portable 4 WHITE LED light stand has a satin Silver Base, a flat mirror top with 4 extra bright LED lights in white that remain fully lit and DO NOT twinkle to highlight your crystal and glass art. There is an on-off switch on the side. Use 3 AA batteries for days of continuous use. Batteries are not included, click for AA batteries made for LED bases. This 3 3/8" round, portable 4 WHITE LED light stand has a shiny Black Base, a flat mirror top with 4 extra bright LED lights in white that remain fully lit and DO NOT twinkle. There is an on-off switch on the side. 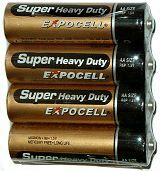 Use 3 AA batteries for up to 48 hours continuous use. Batteries are not included, click for AA batteries. It's finally here! New electric or battery operated stationary 4 WHITE LED light stand so you can plug it in and forget it! The base has a shiny Black finish, a flat mirror top and puts out continuous white light that does not twinkle. There is an On/Off switch on the side and the 5V AC adapter is included or use 3 AAA batteries for days of use. Batteries are not included, click for AAA batteries. This base is for those who requested a small electric operated stationary LED light stand that saves you money on batteries! The base has 4 WHITE LED lights that stay on and do not twinkle, a satin Silver finish and a 3" W flat mirror top. There is an On/Off switch on the side and the 5V AC adapter is included or use 3 AAA batteries for days of use. Batteries are not included, click for AAA batteries. This 4" round, portable 4 white LED light stand offers an inexpensive, portable lighting solution for your larger centerpieces, art sculptures or paperweights! It has a Metallic Blue color base and flat mirror top with 4 extra bright LED lights in white that produce continuous bright white light. There is an on-off switch on the side. Requires 3 AA HEAVY DUTY batteries for days of continuous use. 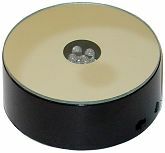 Batteries are not included, click for AA batteries made for LED bases. Base will NOT WORK with oversized Alkaline batteries, use heavy duty batteries ONLY. This 4" round, portable 7 white LED light stand offers an excellent, portable lighting solution for your larger centerpieces, art sculptures or paperweights! 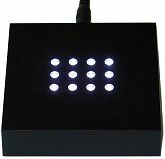 It has a shiny Black Base with a flat mirror top with 7 extra bright LED lights in white that produce twinkling yet continuous bright white light. There is an on-off switch on the side. Use 3 AAA batteries for up to 24 hours continuous use. Batteries are not included, click for AAA batteries made for LED bases. 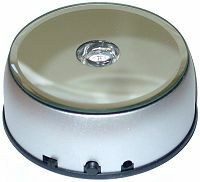 This value priced rotating (1RPM), mirror top LED has a shiny black base with a flat surface rotating mirror top over a chrome interior where 4 WHITE LED lights produce twinkling yet continuous bright white light to highlight your treasured piece. Available below in larger sizes and styles. Base has On/Off switch with a 6V AC adapter included or use 3 AAA batteries for days of continuous use. Base does NOT rotate in battery mode. Batteries are not included, click for AAA batteries. 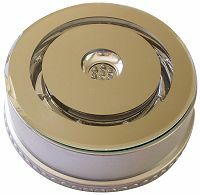 This value priced rotating (1RPM), mirror top LED has a brushed silver base with a flat surface rotating mirror top over a chrome interior where 4 WHITE LED lights produce twinkling yet continuous bright white light to highlight your treasured piece. Available below in larger sizes and styles. Base has On/Off switch with a 6V AC adapter included or use 3 AAA batteries for days of continuous use. Base does NOT rotate in battery mode. Base is 3 1/2" W, rotating tapered top is 3 1/8" W. Batteries are not included, click for AAA batteries. This value priced rotating (1RPM), mirror top LED light stand offers a stylish, eye catching look for your sculptures, crystal, art pieces or paperweights! It has a brushed silver or polished black base with a flat rotating mirror top over a chrome interior where 7 WHITE LED lights produce constant, bright white light to highlight your treasured piece. The base has push On/Off switch and is boxed with a 6V AC adapter included or use 3 AA batteries for days of continuous use. Base does NOT rotate in battery mode. Batteries are not included, click for AA batteries. This value priced rotating (1RPM), mirror top LED light stand offers a stylish, eye catching look for your sculptures, crystal, art pieces or paperweights! It has a brushed silver or polished black base with a flat rotating mirror top over a chrome interior where 7 WHITE LED lights produce constant bright white light to highlight your treasured piece. Also available in 7 LED color lights above. Base has On/Off switch and is boxed with a 6V AC adapter included or use 3 AA batteries for days of continuous use. Base does NOT rotate in battery mode. Batteries are not included, click for AA batteries. This mirror top LED Light base is 4" W and has next generation BLINDING LED lights in White, Red, Blue and Green to illuminate your favorite crystals, art pieces or memorial glass! Choose from 10 different light shows by pressing the toggle button. There is an on-off switch on the side. Use 3 AAA batteries for hours of continuous use or buy with with the electric cord included. Buy Electric Cord only. 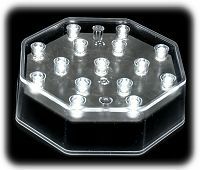 Next Generation LED Light base is 3 1/2" W with ultimate flexibility for light settings and rotary function in battery or plug-in mode for your crystals, art pieces or memorial glass! 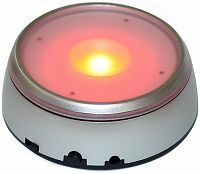 The satin silver base has a recessed mirror top with 4 SUPER bright LED lights. Choose from 10 different light shows by pressing the toggle button. There is an on-off and rotary switch on the side. Use 3 AAA batteries for hours of continuous use or buy with with the electric cord included. Buy Electric Cord only. No need to call!! 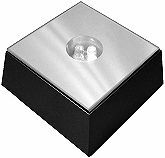 At your request we now have a high quality, large 4" W version of our battery or electric rotary light base with total flexibility for light settings and rotary function for your awards, 3D photos, crystals or memorial glass! The satin silver base has a flat mirror top with 4 SUPER bright LED lights. Choose from 10 different light shows by pressing the toggle button. There is an on-off and rotary switch on the side. 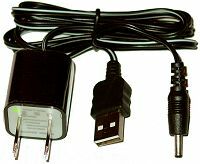 Use 3 AA batteries or plug in with the electric cord included which includes USB adapter. Draw attention to your memorial glass or favorite crystal without the inconvenience of a bulky light stand! 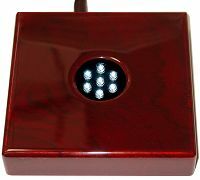 Elegant gallery quality 2 3/4" square light base has 9 extra bright white LED lights that remain fully lit and do not twinkle. The sturdy satin black finish base has 4 cushion pads for scratch protection and is boxed with a 4.5 volt AC adapter included, there is no on/off switch. This light base is perfect for your memorial glass, art glass pieces or crystals as the continuous white light draws attention to your piece without the inconvenience of a bulky light stand! 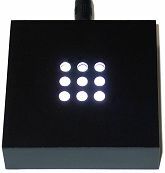 Elegant gallery quality 3 5/8" square light base has 12 extra bright white LED lights to create a larger lighted area 1 3/8"L by 1" W. The sturdy satin black finish base has 4 cushion pads for scratch protection and is boxed with a 4.5 volt AC adapter included, there is no on/off switch. 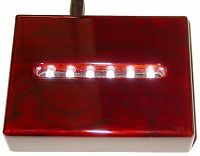 This sleek 4 1/4" long by 2 3/8" wide rectangular art gallery style light base has 10 extra bright white LED lights set together in the center. The base has a modern satin black finish, cushion pads for scratch protection and 10 white LED lights that are centered for maximum focus on your display piece. Gift boxed with a 4.5 volt AC adapter included, there is no on/off switch. This light stand offers sophisticated light decor for your glass sculptures, art pieces or paperweights! 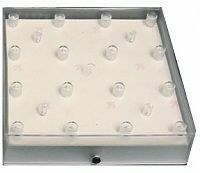 Large 4 7/8" long by 3 1/4" wide electric light base has 12 extra bright white LED lights. 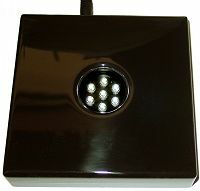 This high quality, light weight black base has 12 bright LED lights that produce continuous white light. This base has 4 cushion pads for scratch protection and is boxed with a 4.5 volt AC adapter included, there is no on/off switch. This extra large 7 3/4" L by 3 7/8" W sleek black light base has 18 extra bright white LED lights that will highlight your treasured piece with carefree elegance! 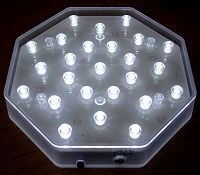 The 18 white LED lights remain fully lit and do not twinkle in the 2 1/4" L lighted area. This base has 4 cushion pads for scratch protection and is gift boxed with a 4.5 volt AC adapter included, there is no on/off switch. Heirloom quality wood light base has 6 extra bright white LED lights that stay on continuously. This hand crafted, black lacquer wood light stand has an on/off switch, a plush velour base for scratch protection and is gift boxed with a 4.5 volt AC adapter included. Easily highlight your memorial glass, art pieces or crystals without the inconvenience of a bulky light stand or the hassle of batteries! Art gallery quality wood light base has 8 extra bright white LED lights that stay on and do not twinkle. This sleek black lacquer wood light stand has an on/off switch, a plush velour base for scratch protection and is gift boxed with a 4.5 volt AC adapter included. Show off your awards, paperweights, 3D photos or crystals without the inconvenience of a bulky light stand or the hassle of batteries! 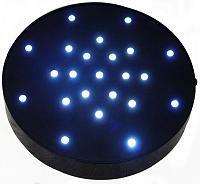 High tech, extra large wood light base has 11 white LED lights that stay on and do not twinkle. This sleek black lacquer wood light stand has an on/off switch, a plush velour base for scratch protection all in a silver gift box with a 4.5 volt AC adapter included. 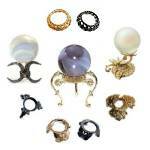 Use for memorial glass, crystals, rocks and minerals or any large piece! Now in stock! Refill AG13 10-pack alkaline button cell batteries for our LED-MSC & LED-MSW mini light bases. Use with any device that requires AG13 button batteries.